A house, barn, outbildings and acres in Braintree, Massachusetts, with a commanding view of all of the lower and part of the upper harbour of Boston. THAT pleasant PLACE in Braintree, that commands a full view of all the lower and part of the upper harbour of Boston, 9-1/4 miles fro town, with a very good House, Barn and Out-Houses, all in handsoe repair, with about 33 acres of Land, and a good Orchard, some of which is of the first quality. The terms of payment will be made convenient to the purchaser, and will be made known at the time of sale. - For further particulars inquire of JOSEPH WOODWARD. N.B. 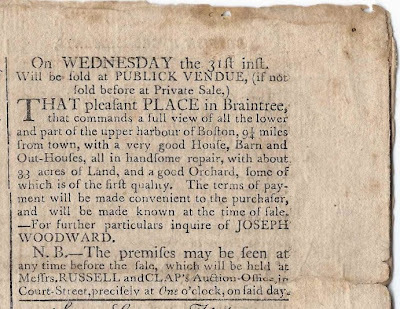 - The premises may be seen at any time before the sale, which will be held at Messrs. RUSSELL and CLAP's Auction-Office in Court-Street, precisely at One o'clock on said day. Very tempting! Though no doubt looking a bit different over 220 years later. I wonder if this farm is/was located in the Blue Hills? If so, maybe I've hiked over it. 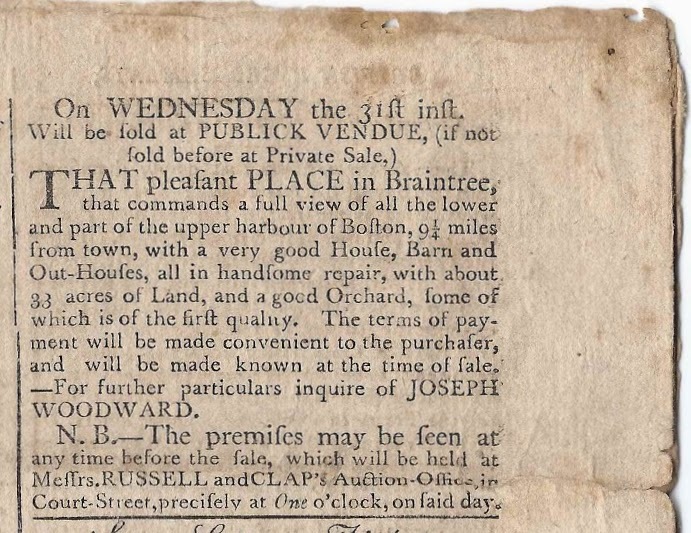 I found a deed dated 29 November 1786 where a Joseph Woodward acquired a parcel of land at Braintree, Massachusetts, from Royall Tyler (1757-1826), a playwright and jurist who served on the Supreme Court of Vermont. The deed is held at the Harvard Law School Library.